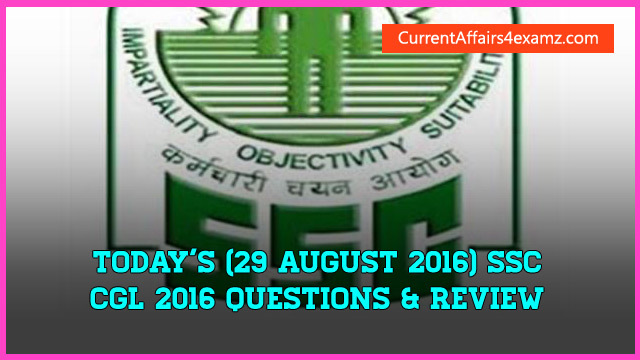 Hi Aspirants, today (29/08/2016) is the third day of SSC CGL Tier I Exam. In this post we will be sharing with you the GK, English, Reasoning and Quatitative Aptitude questions asked in today's exam. There are 25 question per section and each question carries 2 marks. Time limit for Online Examination is 75 minutes and for each wrong answer 0.50 mark will be deducted. Reasoning Section Review: Questions were from Number Series, Matrix, Alphabet Series, Picture Diagram, Analogy, Water Image etc. Questions were of easy level. English Section Review: Idiom/phrases, Antonym & Synonym, Reading Comprehension, Error Detection, Sentence Improvement, Spelling Correction etc. Level is from Easy to Moderate. 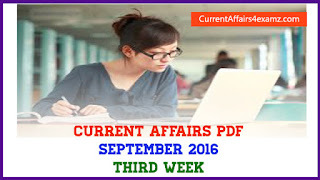 GK Section Review: Moderate Level Questions from Current Affairs, History etc. Aptitude Section Review: Bar Chart, Number Series, Trigonometry, Geometry, Percentage, Speed & Distance, Average, etc. 10. Washing Machine is based on what concept?